Welcome back to The Vet Life. Animal Planet just announced the TV show’s fourth season will debut in April. Season four of The Vet Life premieres on Animal Planet on April 6th at 9 p.m. ET/PT. Dr. Diarra Blue, Dr. Aubrey Ross and Dr. Michael Lavigne are back and busier than ever in an all new season of THE VET LIFE which premieres on Saturday, April 6th at 9 PM ET/PT.. This season, audiences continue to follow the daily lives of the passionate, lovable vets at their Cy-Fair animal hospital in Houston as they encounter fascinating animal cases each and every day. And the adventures grow this season as the doctors open a second animal clinic in the Houston area. In previous seasons, the doctors have examined a feisty rescued tiger found roaming a neighborhood in Houston, removed a massive tumor from Red the Golden Retriever’s head and performed emergency C-Sections on multiple pregnant dogs. 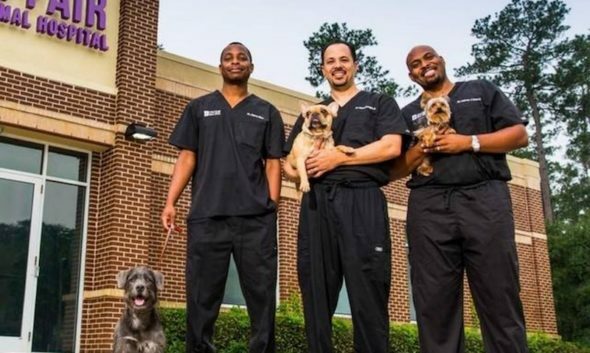 The dedicated vets jumped into action when Hurricane Harvey devastated their community by saving puppies found in the middle of floodwater, treating a family goat named Jetta on the brink of death, and operating on Jasper the cat about to lose his leg – all while dealing with family and staff that suffered from the storm and lost their homes. This season stories include: Dr. Blue and Dr. Lavinge visiting a pig rescue and competing for the title of superior pig whisperer; encounters with Pablo the ‘snarting’ goat and Dr. Ross treating an albino ferret named Alexander with adrenal disease. Additionally, the vets will test the health of an owner’s pet Fennec Fox named Rocket and Kinkajou named Baloo, will treat Aubie a sweet Kunekune Piglet rescued from a fraternity house, and more. With a thriving clinic, their personal lives are booming too. Dr. Blue and his wife Jessica prepare for the arrival of their third child, Dr. Ross and wife Tauvia introduce their new baby girl, while Dr. Lavinge and his wife Anne settle into their new home and prepare for “Empty Nest Syndrome” just a few years away. What do you think? Have you seen The Vet Life? Do you plan on watching the new season? More about: Animal Planet TV shows: canceled or renewed?, The Vet Life, The Vet Life: canceled or renewed? My family and I love The Vet Life. Not only are there interesting cases, the show shows real friendships, happy marriages and docs yhstlove love love their families, the animals and each other. This show should be aired for a long long time. I am SO glad that The Vet Life was brought back. These doctors are role models for everyone! They teach us all about getting along, competition, generational kindness to the young, middle-aged and elderly, compassion and everything else good. I enjoy the interaction of these docs. I also grew up in a large family (Italian) and having several generations around daily was the best life for a child. Continue to enjoy everyone. love these three.cant wait.thank you for aa great and fun show also very much love the respect and knowledge shown by the doctors love the family get togethers and laugh with them. this is great tv and again cant wait…….daisy and Bernie. I love the show The Vet life can’t wait to see the new season I’m a big fan. Missed the show and the Vets! Joyful for the return! The Vet Life, Yea ! These guys are funny, and great at what they do .